The biggest source for videogame reviews in Japan has finally awarded a Western title its top honor. 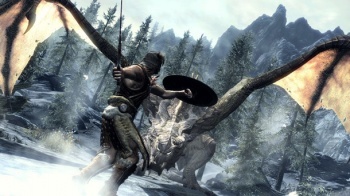 On 11/11/11, tiny indie developer Bethesda released Skyrim, a modestly sized fantasy RPG that told the same, tired story of a hero fighting dragons. Perhaps you've heard of it. Since then, the game has sold a whopping 3,500,000 copies and received enviable heaps of critical praise. Now, the game can craft one more flawless sapphire into its crown: Famed Japanese reviewer Famitsu has given it a 40/40, making it the first game ever produced in the West to receive its perfect score. Famitsu has been circulating around Japan since the mid-eighties, and since then, has grown a base of over half a million subscribers. That's not too shabby for a print publication in the twenty-first century. With a thriving series of magazines and an active website, it's easily become the largest source of game reviews in the country, and arguably the most influential. Still, no Western-made game has impressed them enough to slap with a 40/40, until now. If you were wondering why a "40/40" instead of, say, a 5/5 or a 10/10, Famitsu gets its score from four separate reviewers who all rate on a much more standard ten scale, making it all the more difficult for games to join the ranks of the seventeen (counting Skyrim) titles to ever make the cut. Previous games making rank include Ocarina of Time, Final Fantasy VII, and Pokemon: Black and White. In the spirit of full disclosure, Nintendogs is in there too (not that there's anything wrong with playing virtual fetch with virtual puppies, mind you). Skyrim being a Western title also means that the West got it first, meaning Famitsu's vast Japanese readership is going to have to wait until the game is finally released to Asian shores on December 8th before deciding for themselves if the coveted 40 was deserved. I wonder what the word "Dovakhiin" sounds like in a Nordic Japanese accent?